Based on the first 3 pages, I completely rejected “Welcome to the Saturday Night Club” when I first saw it. But I happened to flip to the end to the page when the angry seniors are coming to save the day, and I had to go back to find out how what appeared to be a tacky oneshot morphed into something with angry seniors slow-mo rolling down a hall (or so I imagined). 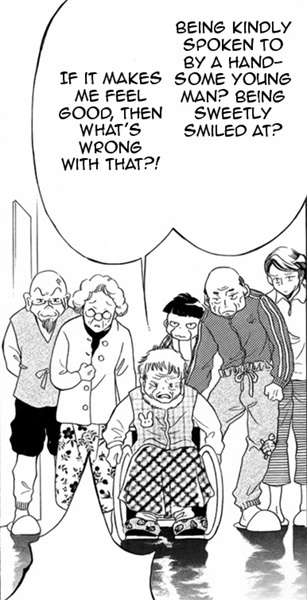 The thing I like the most about this oneshot is that it acknowledged that old people, old women in particular, still fantasize about handsome young men. I also liked that Hideo felt a sense of purpose in fulfilling that fantasy as well as feeling the need to make sure that seniors aren’t alone and that they are having fun. It’s a sweet message and one that we younger people should take to heart. I’m glad I took the time to go back and read this oneshot because I was pleasantly surprised and delighted. It took me a while to decide whether to translate this oneshot. I didn’t feel that many people would give it a try because the artwork is very deformed and tacky at the beginning. It’s actually funny how badly the young people are drawn while the seniors are drawn quite well. I wonder if that’s on purpose or whether it’s a quirk of the mangaka’s style. I’ll have to find other works by Rin Kokiai to see. Anyhow, I know a lot of shoujo readers are drawn in by the cover art, so I knew it would be challenge to attract readership. On top of that, there’s not much in terms of romantic tension in the story. That seems to be the thing that prompts good word of mouth. And as predicted, this oneshot has abysmal readership, but I’m glad I put it out because I enjoyed doing the translation and I wanted to test my readership prediction. Needless to say, I hope this blog post will get some of you to give the oneshot a try. Okay… moving on, here are some of my favorite scenes. I particularly liked Hideo being lovable and Madam Misa priceless facial expressions.